The location data on the Apple iPhone, iPad, or iPod Touch is can be incorrect at times, forcing the need to change it manually. Unfortunately, there is no way to change the location manually using the device itself. The device uses the Skyhook service to determine your location through your Wi-Fi access point and Bluetooth networks. 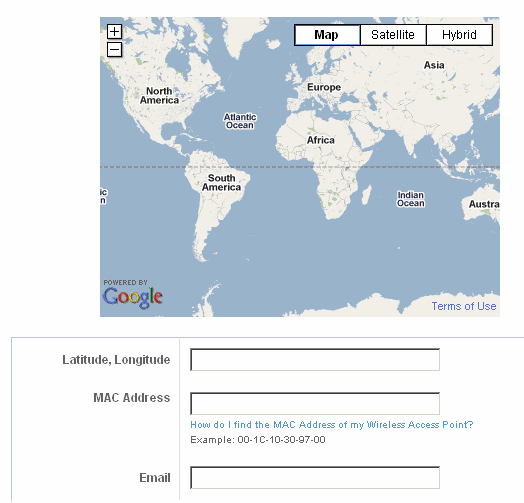 If your device is not grabbing the correct location, try the following steps. Before trying anything else, try a quick reset. Press and hold the “Power” and “Home” buttons simultaneously for about 10 seconds. The device should eventually shut off. Then you can power it back on. Open “Settings” and set “Wi-Fi” and “Bluetooth” to “On“. This will allow the device to detect what is around. Wander around a bit and see if you can connect to a different Wi-Fi network. Perhaps there is a coffee shop nearby you can connect the device to? Connecting to more networks around you will help the device get acclimated to where it really is. If you are connecting to your own Wi-Fi equipment, you may want to try to change the SSID on the router to a new name. Try to make it something unique, as that’s the way your location is determined by the iPad and iPod Touch. If you’ve tried all of the above and you still can get the right location displayed. you may want to submit a Wi-Fi access point to the Skyhook database. You’ll need to find the longitude and the latitude of your location, the MAC Address to your router (go to the Status tab in the Linksys router setup), and email address. Once you submit this information, it can take over a week to take effect.